Healthcare organizations are looking beyond language translation to promote better understanding of patients from other countries. Navigating the American healthcare system can be a complex and frustrating task for patients. There are the rushed appointments, the hours spent trying to figure out insurance coverage, and the haggling over bills. The task is even more challenging for many foreign-born people living in the United States. Faced with barriers such as limited English skills and inexperience with the American medical system, some people who are immigrants shy away from accessing healthcare services. And those who do seek care are often faced with providers who are ignorant of other cultures. Many healthcare institutions are responding to this problem by offering translation services to help people who are immigrants better communicate with medical and social services personnel. And a growing number of organizations are expanding their cultural competency efforts to include approaches centered on the social work concepts of taking a person-in-environment perspective, using empathetic listening, and respecting a patient’s right to self-determination. That means social workers can play important roles in developing and implementing programs to help people who are immigrants feel more welcome in the healthcare system. The number of foreign-born people living in the United States has risen significantly during the past decade, growing from 28.4 million in 2000 to 34.2 million in 2004, according to the U.S. Census Bureau. In 2007, the number topped 38 million. There is evidence that language and cultural barriers lead to poorer health outcomes among ethnic minorities, including people who are immigrants. More than one quarter of foreign-born individuals do not have health insurance, according to the U.S. Department of Homeland Security. And researchers at the Institute of Medicine captured attention nationwide in 2002 with the report “Unequal Treatment: Confronting Racial and Ethnic Disparities in Healthcare,” which found that minorities were less likely than whites to receive needed services for health problems such as cancer, cardiovascular disease, HIV/AIDS, and mental illness. Recent research shows that people who are immigrants continue to have trouble accessing medical care. For example, one study (Aragones, Trinh-Shevrin, & Gany, 2009) reported that physicians serving Chinese immigrants in New York City inadequately followed cancer-screening guidelines, while another (Schwartz, Fakhouri, Bartoces, Monsur, & Younis, 2008) found that mammography screenings were less likely to be performed among Arab American women in the Detroit area than they were among other Michigan women. Disparities also exist in oral healthcare (Garcia, Codoret, & Henshaw, 2008; Maserejian, Trachtenberg, Hayes, & Tavares, 2008). Language is at the core of healthcare organizations’ efforts to reduce and eliminate disparities. Various companies, including Language Line Services, Avantpage, CyraCom International Inc., and viaLanguage Inc., offer interpretation and translation services specifically designed for medical entities. These companies also offer ancillary services, such as research on immigrant populations, help with marketing to multicultural audiences, language proficiency assessments, and training for medical interpreters. While Spanish is the most-used foreign language in healthcare settings, other languages are encountered as well. CyraCom International reported that 143 languages were used at the hospitals it served in 2007. And much of viaLanguage’s business involves languages other than Spanish, including Chinese, Korean, Hmong, Russian, and Vietnamese, says Chanin Ballance, CEO of the Portland, OR-based company. Using interpretation and translation services is not new, but now institutions are taking a more formal approach. Organizations are realizing that there is more to interpretation than just putting a patient in a room with someone who speaks the same language, says Sheila D’Nodal, MD, vice president of ambulatory services and cultural diversity officer at South Nassau Communities Hospital in Oceanside, NY. The hospital provides training in medical translation to employees, so vital information about patients’ health conditions is not missed. Other organizations are turning to data collection to get a better understanding of how to meet the need for language services. HealthPartners, a Bloomington, MN-based organization that provides medical care and insurance coverage in Minnesota and western Wisconsin, has collected race, ethnicity, and language preference data from more than 425,000 patients and health plan members. The data, which were provided voluntarily, give HealthPartners a clear view of the changing demographics of its patient population and allow the organization to provide targeted language services, says Donna Zimmerman, HealthPartners’ vice president of government and community relations. Among the changes the organization has seen is a rapid increase in the number of Somali and Hmong immigrants, Zimmerman says. Demand for interpretation and translation services will continue to grow as more healthcare organizations realize the importance of cultural competency and as more states enact laws requiring medical information to be offered in various languages, Ballance says. “And there are always new groups coming to the United States,” she notes. Although the increased use of interpretation and translation services in healthcare is widely seen as a positive trend, some observers question whether organizations are focusing too much on language. Too often, organizations deem themselves culturally competent simply because they can offer care in an immigrant’s language, Cheng says. Ignoring other factors, such as social customs, attitudes toward medical care, and nonverbal communication, is a disservice to patients, she says. Overreliance on interpreters can lead medical professionals to make assumptions about patients that are later proven incorrect, says H. Steven Sims, MD, director of the Chicago Institute for Voice Care. For example, he has noticed providers calling for an interpreter because a patient had a foreign-sounding last name without first determining whether the patient could speak English. Realizing that language is only one part of cultural competency, many organizations are taking integrated approaches toward people who are immigrants. One such organization is Asian Human Services in Chicago, which not only offers primary healthcare services but also mental health services, legal services, employment services, and adult education programs. In addition, the nonprofit operates a charter school focused on the needs of immigrant and refugee children. The broad approach of Asian Human Services is needed because immigrants seeking healthcare services also often require other types of care, says Jing Zhang, PhD, the organization’s program director for community health. Such a comfort level is necessary for people who are immigrants and are wary about accessing services, especially mental health services. Cheng says many immigrants who would otherwise not be willing to seek mental health services come to the Charles B. Wang Community Health Center for help because they are familiar with the center’s other offerings, which include internal medicine, dental healthcare, and pediatric care. Many healthcare organizations also have recognized the importance of outreach to immigrant communities. Meetings between medical personnel and leaders in immigrant communities are becoming common, as are health education programs and health screening events held at churches and other gathering places. Going out and meeting people who are immigrants where they are instead of always asking them to come to a facility goes a long way in building strong relationships between a healthcare organization and the surrounding community, says Maria Fonte, LMSW, a social worker at the Family Medicine Center at South Nassau Communities Hospital. Community outreach makes good business sense as well. Representatives of several healthcare organizations report that the number of people who are immigrants using their services has grown as word about the organizations’ cultural competency efforts spreads and the organizations gain a reputation of being immigrant friendly. Some institutions use their connections in the community to recruit immigrants to become healthcare workers. One workforce development initiative attracting attention is the Blue Cross Blue Shield of Minnesota Foundation’s Critical Links program, which uses training, grants, and research to promote the use of community health workers. Such workers deliver a variety of services to patients who face linguistic and cultural barriers to accessing healthcare. These services can include helping patients obtain health insurance, making medical appointments, ensuring that patients follow through on treatment recommendations, and providing education about health issues such as diabetes or teenage pregnancy. Community health workers are often bilingual and bicultural. Healthcare organizations that want to improve relations with people who are immigrants will increasingly appreciate and seek out the broad perspective brought both by community health workers and by social workers, says Jocelyn Ancheta, program officer for the Critical Links initiative. “I think immigration trends mean that there is great potential for these fields to grow,” Ancheta says. The demographic trends are changing so quickly that it is no longer enough for healthcare organizations to train their employees about specific cultures, says Grace Mose, PhD, director of the Immigrant Women’s Health Initiative at Family Planning Advocates of New York State in Albany. Instead, organizations must help employees develop skills, such as empathetic listening, patient empowerment, and relationship building, that can be applied to people of all cultures. Social workers are especially well equipped to help healthcare groups implement more universal approaches to cultural competency, Fonte says. “The very fact that we’re social workers means that we’re taught to be nonjudgmental, to listen with empathy, and to be compassionate,” she says. Many social workers are already being sought out for their expertise. One is Annie Stanfield-Hagert, LSW, a Philadelphia-based social worker who has done trainings with health organizations that seek guidance about working with people from different cultures. 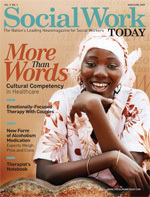 She advises social workers employed in culturally diverse healthcare settings to remember how their nonverbal communications, such as gestures or style of dress, may influence patients. For example, the informal approach used by many Americans may dismay patients from cultures where such informality is seen as a sign of being uneducated or lower class. Social workers also must consider the role of family in other cultures. Foreign-born patients may want spouses, children, and other relatives involved in medical decision making, she says. In addition, social workers need to continuously reflect on their values and how these values may affect their interactions with clients from foreign countries. A reaction to a patient from another culture that may seem normal to a provider may be offensive to a patient, Mose says. She used the example of a doctor or social worker who expresses shock when a woman from another country discloses that she has been circumcised, a common practice in many countries. Sims suggests that social workers and other providers in healthcare settings focus not so much on what they know about other cultures but what they don’t know. The practice of cultural humility will ensure that the provider is listening to what patients want. Sims also advocates the “platinum rule,” which emphasizes the importance of treating patients as they would like to be treated, not as providers would like to be treated. How many people are coming to the United States? The U.S. Department of Homeland Security tracks immigration patterns in this country. The department divides legal immigrants into several groups, including those who have obtained legal permanent resident status, those who have been naturalized, and those who have been admitted into the country as refugees. The department also follows trends in unauthorized immigration. Overall, the number of people obtaining legal permanent resident status or being naturalized has grown during the past decade. Almost 1.1 million people were granted legal permanent resident status in 2007, up from 653,206 people in 1998. The number of naturalizations increased from 461,169 in 1998 to 660,477 in 2007. Most of the people seeking legal permanent resident status or naturalization are from Asia, North America, or Europe. The number of refugee arrivals is dropping. Slightly more than 48,000 refugees arrived in the United States in 2007, down from 76,181 in 1998. Most refugees come from Asia, Africa, or Europe. An estimated 11.6 million unauthorized immigrants were living in the United States in 2008. That compares with 8.5 million unauthorized immigrants in 2000. Almost two thirds of unauthorized immigrants come from Mexico. What are characteristics of the foreign-born population? There were 38.1 million foreign-born people living in the United States in 2007, according to the U.S. Census Bureau’s American Community Survey. • Most foreign-born people were born in Mexico. Other countries on top of the country-of-birth list include China, the Philippines, India, El Salvador, Vietnam, and Korea. • Sixty-eight percent of the foreign-born people are high school graduates, and about 27% have a bachelor’s degree. • The median household income for the foreign-born population is $46,881. Those from India, Australia, South Africa, and the Philippines have the highest median household incomes, while immigrants from Somalia and the Dominican Republic had some of the lowest median household incomes. • More than one half of the foreign-born population entered the United States in 1990 or later. How has immigration changed the mix of languages spoken in the United States? The Modern Language Association reports that nearly 20% of people living in the United States speak a language other than English. • Spanish is by far the most-used foreign language in the United States. Other foreign languages spoken by a sizable number of people include Chinese, Tagalog, French, Vietnamese, German, Korean, Russian, Italian, Arabic, and Portuguese. For more information, visit www.mla.org. Aragones, A., Trinh-Shevrin, C., & Gany, F. (2009). Cancer screening practices among physicians serving Chinese immigrants. Journal of Health Care for the Poor and Underserved, 20(1), 64-73. Garcia, R. I., Cadoret, C. A., & Henshaw, M. (2008). Multicultural issues in oral health. Dental Clinics of North America, 52(2), 319-332. Maserejian, N. N., Trachtenberg, F., Hayes, C., & Tavares, M. (2008). Oral health disparities in children of immigrants: Dental caries experience at enrollment and during follow-up in the New England Children’s Amalgam Trial. Journal of Public Health Dentistry, 68(1), 14-21.